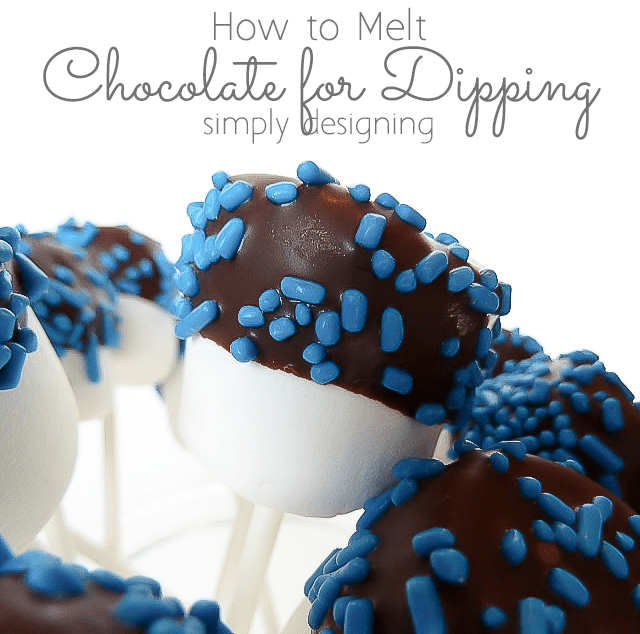 Today I am excited to share my secrets, tips, and tricks for how to melt chocolate for dipping! 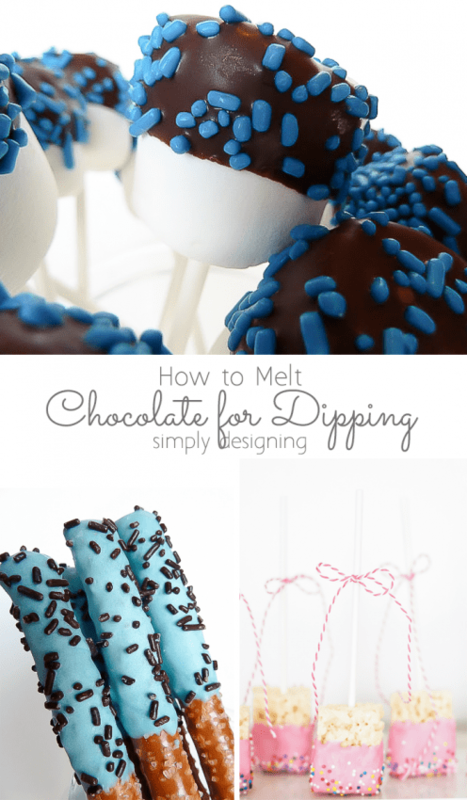 If you have ever struggled to melt chocolate well, you don’t want to miss this post!I love dipping things in chocolate! 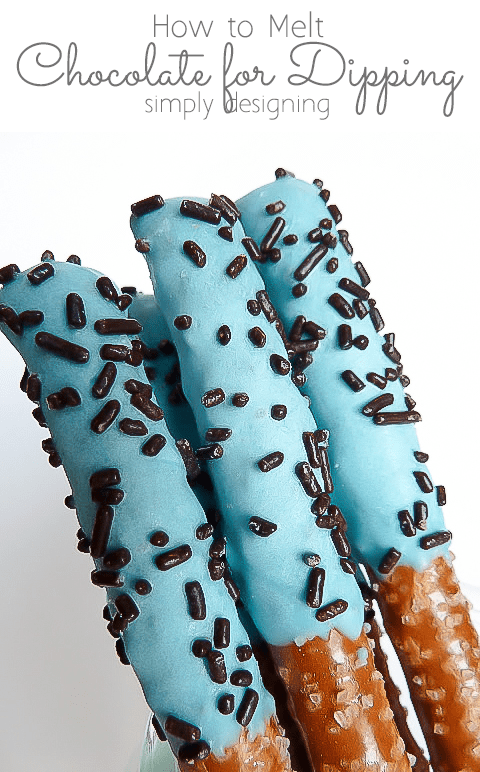 Almost anything tastes better dipped in chocolate! Chocolate covered pretzels, marshmallows, cookies, strawberries, bananas, raspberries…I love chocolate covered treats! 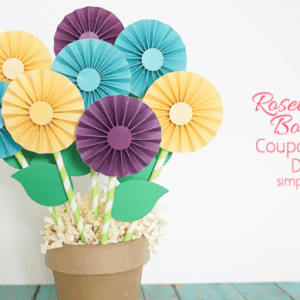 But not only does it taste good, it is also a simple way to make homemade goodies! Before you dip, you have to know how to melt chocolate. It sounds simple, yet I have found, that it can be so easy to mess up! I recently received an email asking for help and advice on how to melt chocolate so I thought I would share all of my hints, tricks, and tips with everyone! How to Melt Chocolate for Dipping in the microwave, a double broiler, or with a special melting pot. Decide if you are going to use regular chocolate (like chocolate chips) or melting chocolate (like Wilton’s melting chocolate.) This will make a difference. Regular chocolate is more difficult to melt correctly. Melting chocolate has more room for error. Melting Chocolate in a double boiler will give you the best results with the least room for error, however, it takes longer and is not always the easiest way. To melt in a double boiler, place a small amount of water in the bottom pan of a double boiler, the water should not touch the top pot. Place the chocolate chips or melting chocolate in the top pot and start heating. Stir frequently until the chocolate is just melted, turn the heat off and dip away. Melting chocolate in the microwave is quickest, dirties the fewest dishes, and is my go-to method even though it can be trickier. When melting chocolate in the microwave, place the chocolate in a microwave-safe dish (I use a mug or a Disposable Dipping Tray placed on top of a microwavable plate). Be careful, the dish will get hot! Whether you are using regular chocolate or melting chocolate, set the power to 50% and microwave for 30 seconds at a time. Stir in between each 30-second interval. This is important! Chocolate can actually retain its shape while being completely melted, so if you go by sight alone, you will overheat your chocolate! When your chocolate is mostly melted, use smaller intervals, 20 seconds, 10 seconds, 8 seconds. Really. A few seconds can make the difference between melted chocolate and overheated chocolate, so be careful!!! When your chocolate (or melting chocolate) is almost completely melted, just stir it. Most likely the last couple of chocolate pieces will melt. This is a great way to ensure you do not overheat your chocolate. You can also melt chocolate using a Melting Pot like this one HERE. When learning how to melt chocolate for dipping you want to be sure you don’t overheat it. Chocolate is easy to overheat. The symptoms of overheated chocolate are tricky to spot because they are similar to chocolate that is not yet fully melted. Overheated chocolate will be thick, chunky and dry. If you melt overheated chocolate more, it will just get thicker and drier. 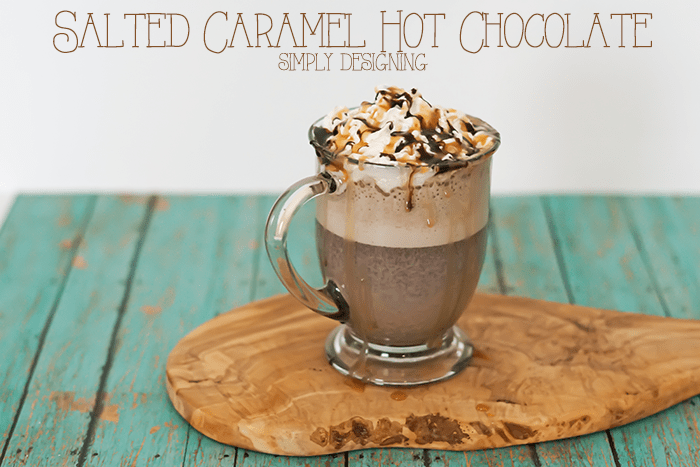 There is a fine line between melted chocolate and overheated chocolate so just be careful. Now you want to you know the real secret for how to melt chocolate for dipping?? As a fair warning, adding vegetable oil can make it so that the chocolate doesn’t harden as quickly or as hard. It can make the chocolate a bit softer. 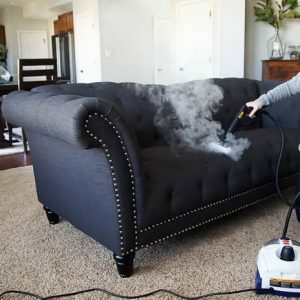 So you will only want to use a touch of oil. I’ve done it so many times I just kind of know how much to add, but a good place to start is about 1 tsp per 1 cup of chocolate chips. So next time you decide to dip chocolate, melt carefully, stirring frequently, and add a touch of vegetable oil to your chocolate to ensure perfectly dipped treats! You can use melting chocolate for dipping things in. If you do, do not add additional veggie oil. I personally think the taste of regular chocolate is better though it is a personal preference. Yes, veggie or canola oil is very very helpful when melting chocolate in the microwave. Also, be sure to melt on 50% or lower power! Is there a specific amount of vegi oil you must use? 1 tsp per cup of chips. Have you tried coconut oil? Do you think the same 1tsp per cup of chips? Is there anything you can do to save overheated chocolate? It seems such a shame to throw it away but it looks unusable! I NEVER throw away chocolate, it can always be used for brownies, cakes etc. does milk chocolate melt? i have had trouble with it. That’s not true, believe it or not, water ruins chocolate but a tablespoon of boiled water ( very hot ) will return the chocolate back to a beautiful, shiny liquid chocolate for dipping, you can salvage that dry over cooked chocolate! Try it! Add a tablespoons or two to the overheated Chocolate and see what happens! My chocolate was ruined stiff as could be tried the water added it twice and kept stirring added a little bit ofparaffin wax and it turned out awesome thank you so much for your tip ???? Thank you for the idea with the vegetable oil, I was melting white chocolate for oreo cookie balls and over heated it, the vegetable oil saved my cookies. Your the best!!! Thank you for this post! I&#39;m going to have another try at melting chocolate today. It wasn&#39;t too bad last time but it took a VERY long time to set. Did I do something wrong? Can I keep the chocolate in its melted form in a mini crock pot for fondue dipping? Or will the low crock pot heat seize it? Mspattyn – that is a great question! And the answer is maybe. 🙂 It just depends on the crock pot temperature. So I would suggest trying it out to see if it would work. If it is too hot the chocolate can burn and go bad, and if it is too cool then the chocolate will just get hard again. All crock pots are different and I have never used one for this purpose so I am not totally sure. It&#39;s actually called a &quot;double boiler&quot;, not a &quot;double broiler&quot; 😉 You might want to edit. Thanks for the tips! How long does a melted chocolate over a pot last? Could I re-melt again over the pot if is hardened after a while? Can I mix semi-sweet chocolate chips with dark chocolate chips together for melting? I just read that you can use an electric skillet to keep your chocolate warm, while filling. Just place a couple old (not too thick) towels in the skillet first, then your bowl of chocolate. Works wonders, I dipped a whole bag of pretzels this way! Chocolate can be reheated carefully…but it will start to dry out and will reach a point where you can no longer re-heat it. It is pretty obvious when it reached this point and is just really thick! Adding a bit of oil will help you be able to reheat it though. I have to tell you that my candy store-actually a kitchen store-told me to use cocoa butter in place of vegetable oil. I did that recently for a choc fountain and it worked like a gem! There is a trick-use 2 tablespoons to 4 c chocolate. thanks for this! and I just read this after I melted a chocolate. hahahaha! mine turn out difficult to dip with … anyway it&#39;s my first time and will try out next time. Ann,<br /><br />The chocolate should never be too hot to melt the marshmallow. 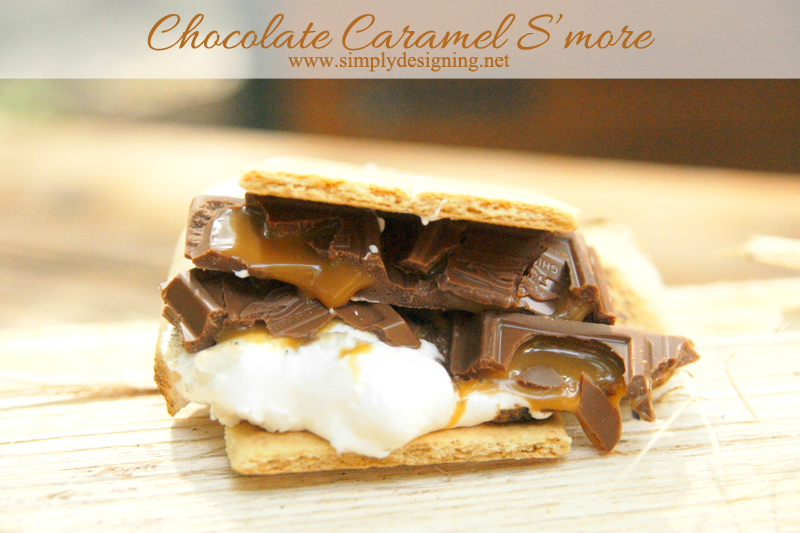 So yes, you can dip the marshmallow in while the chocolate is warm.<br /><br />Thanks for stopping by. Will the veggie oil change the consistency once the chocolate is set, i.e. make it a bit smoother and not quite so hard? Yes it can. Veggie oil isn&#39;t necessary but it helps a lot to prevent overheating and giving the chocolate a very smooth consistency. But yes, use it sparingly because it can make the chocolate softer. I find if I am careful it helps more then hinders though which is why I love to add just a touch! Mine always still sets though! I tried to melt chocolate chips with the vegetable oil &amp; it seems like it doesn&#39;t harden. Did I use too much oil? Yes, it sounds like you had too much oil. Oil can make your chocolate a tiny bit softer and if you add too much, it can have trouble firming up. I like to use no more then 1 Tablespoon of oil for every 2 cups of chocolate chips. When melting chocolate in the microwave, make sure your bowl is COMPLETELY dry, no moisture in it before you microwave. If you do have some moisture, it will chunk up and overheat and ruin your chocolate. I melt chocolate and dip everything in sight every year. I use vegetable shortening instead of oil. I made chocolate covered caramels and it turned out great. I have the problem of my chocolate leaving a heavy layer on whatever I am dipping. It looks chunky not smooth. Chocolate will leave a heavy layer when it is too thick. This could be caused by two things. 1- it is not warm enough so you need to give it a few more seconds to melt before using or 2- it is over heated and became thick and dry. My guess is that the chocolate you are working with has been over heated. Unfortunately there is really no way to save over heated chocolate so you will need to try again with new chocolate. Be careful to take your time and only heat the chocolate up a few seconds at a time on 50% or lower power. If the microwave consistently gives you trouble, try heating it up over a double broiler on the stove. That is easier. hi, after making letters out of melted semi sweet chocolate, i put it in the fridge to harden, after taking them out i noticed the letters started melting. how do i prevent that. Oh no! That is definitely an issue. My initial guess is that you added too much oil to the chocolate. The oil will soften the chocolate so you only want to add just a little bit to keep the chocolate from drying out, but too much that it won’t let it set. The other issue could be that it is just hot outside. I don’t know where you are located, but chocolate will soften quickly in the summer when temperatures get warm, so try keeping them in the fridge until right before you eat them! Thanks so much for your tips. Was heating white chocolate chips in a double boiler (a little more control than the micro – but have used this, too) & it seized up royal after leaving it too long. After trying your oil trick Realized it was even brownish instead of white on the bottom! My save was to carefully whisk in some semi-sweet chocolate chips till the consistency pleased me. Drizzled over the top of the “cranberry bliss” bars & the contrast looks cool! Tastes fine. Hope this helps! Great save! Yes, if white chocolate is overheated, it will turn brown. What a great way to save the chocolate though! Do You actually melt the ‘Candy Melts’ in the piping bag?? How does that work? (I’m sorry if I missed that along the way.) because – Yes! One color cools off while heating the next – its crazy-making! Please advise. Thank You. We have specific instructions for melting chocolate for dipping, but we decided to make chocolate truffles when we were on vacation and didn’t have our dipping info–just the chocolate truffle recipes. All we remembered was that it was really difficult to melt the chocolate and then keep it at the right temperature while dipping (required a heating pad with plastic wrap to protect the heating pad). But we figured we could make the truffles and skip the dipping part. Problem is we really missed the chocolate coating, so I searched the internet for help and found this. And it’s SO much easier than our usual way!!!! The little bit of oil makes a world of difference. Easy to melt, don’t have to worry much about the right temperature for dipping, makes a thinner coating (not too thick, not too thin, just right), etc. PERFECT. Thanks so much for sharing. This will be the method we use in the future! I have a Fondue Fountain, if I leave off the tiers on it, could I use just the base and bowl part to melt my chocolate and keep it melted? I am going to be doing multiple things with the melted chocolate, (some molds, with different fillings, and some dipping) and don’t want to have to keep reheating it, or worrying about leaving it over hot water and having it get too hot, or water get in it, and I know the last time I used the fountain, it ran for a while without hurting the chocolate any. Hi if I want my chocolate not to set after i put in the fridge, I should add more oil when I melt my chocolate ? I have not experimented with trying to keep the chocolate soft. More oil and not putting it in the fridge would probably do the trick. But I am not sure the proportions. 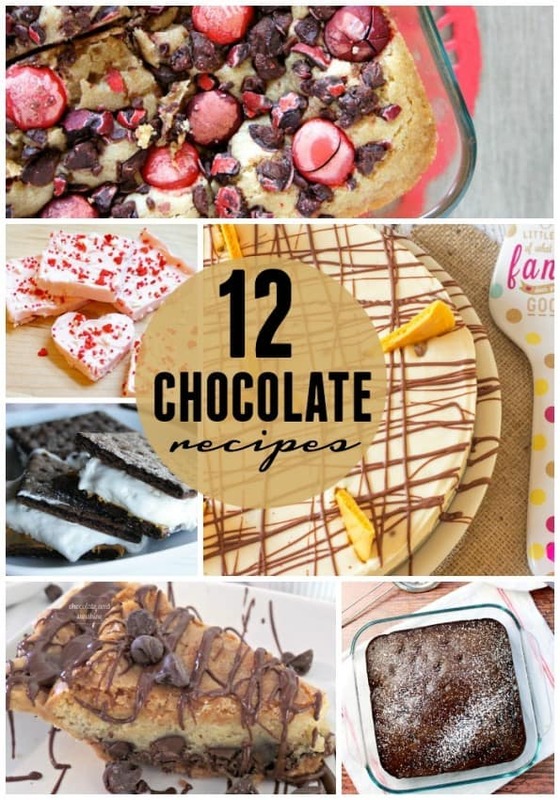 Thank you so much for this post, because I often wanted to melt chocolate, but did not know how. I’ve noticed and learned that oil is a great additive to assist in the melting process. I wonder why paraffin wasn’t mentioned as a way to set the chocolate on the finished product? I’ve found it helpful, but only used a small amount. Thanks. Can you use the oil with gardelli melting chocolate chips? I dipped chocolates last night and the chocolate turned a light brown color. Do you know what causes the chocolate to turn and look used and old? I use shortening which is what the recipe calls for but I have had this problem in the past. It makes my peppermint patties look like they are ruined. Any advice? Thanks your website was interesting and gave me some good ideas. Typically this happens if the chocolate gets too hot and dried out. I would melt it at a lower heat. I have that very melting pot that was linked, and I love it, keeps the chocolate perfectly melted for dipping for hours straight. Used it to make cake balls about 6 months ago for my boyfriend for his birthday, after dipping them I rolled them in toasted coconut (they were German chocolate with pecan flavored). an entire box of cake mix made about 4 dozen, it took few hours to get them all done, probably partly cause I hadn’t made them before. The melted chocolate in that melting pot stayed perfect the entire time. best $30 I spent, I won’t melt chocolate in anything else. easy cleanup too, the little bucket the chocolate goes in is flexible, so ones the chocolate cools, you can just squeeze it a lil and it pops right off. I melted a Hershey’s Symphony bar in a double boiler and added 30 hugs & kisses. (Milk chocolate hugged by white crepe) for dipping potatoe chips. I had to put them in the refrigerator to harden the chocolate. But the chocolate soften at room temperature. What can I add to keep the chocolate from melting. They looked great for one day. I put them in fridge to harden and took out and left them room temperature .